New and exciting cosmetic services are coming to Dr. Bowyer’s office. We’re partnering with Lana Nadirov, a trained nurse with expertise in cosmetic injections, to bring BOTOX, Kybella, and Juvederm procedures to our patients. While you’re improving your appearance through cosmetic dentistry, why stop at just improving your smile? With these new cosmetic services, you can smooth wrinkles, get plumper lips, and remove years of age from your face. BOTOX treatments can smooth out frown lines or crow’s feet. The procedure involves a simple injection, and the effects can last up to four months. Don’t worry about looking “overdone” either – BOTOX treatments look more natural than conventional cosmetic surgery procedures, and they don’t require you to go under the knife. Most procedures only take about 10 minutest – you can get it done on your lunch break! Are you worried about the appearance of your jaw line? Kybella treatments can help. Kybella is an injectable treatment that destroys fat cells that cause a “double chin.” After a few treatments, you’ll see a noticeable improvement in your profile. Kybella is also quick – each procedure only takes about 15 to 20 minutes. 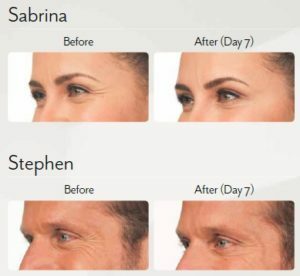 Our new dermal filler treatments address a variety of cosmetic concerns. We have several Juvederm dermal filler options to add volume to your cheeks, smooth out wrinkles, and add volume to your lips for a plumper look. Like the rest of our procedures, the dermal filler process is non-surgical and involves injecting a naturally occurring compound into the problem areas of your face. Results are natural looking and long lasting – the effects can last for up to two years. Our specialist will work with you to come up with a customized treatment plan to address your areas of concern. Don’t wait to make the improvements you’ve always wanted. Contact us today to schedule your appointment! ← Smile in One Day?